Don't be 'snookered' by a bad costume choice at a fancy dress party. Instead get the 'rub of the green' by wearing this unusual and original Snooker Table Outfit. 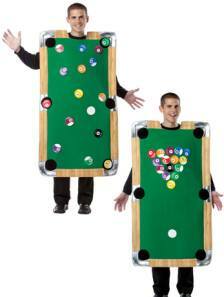 This fab novelty fancy dress costume is perfect for anyone handy with a cue as it has been designed to look like a pool table. It's easy to wear as it comprises of a rectangular shaped tunic which slips on over your own clothes. The green has a flocked finish and the outfit even comes complete with 16 coloured and numbered balls which grip onto the fabric with velcro tabs. You can move the balls around the table, show off your very own trick shots and actually play a mini game - the perfect ice breaker!